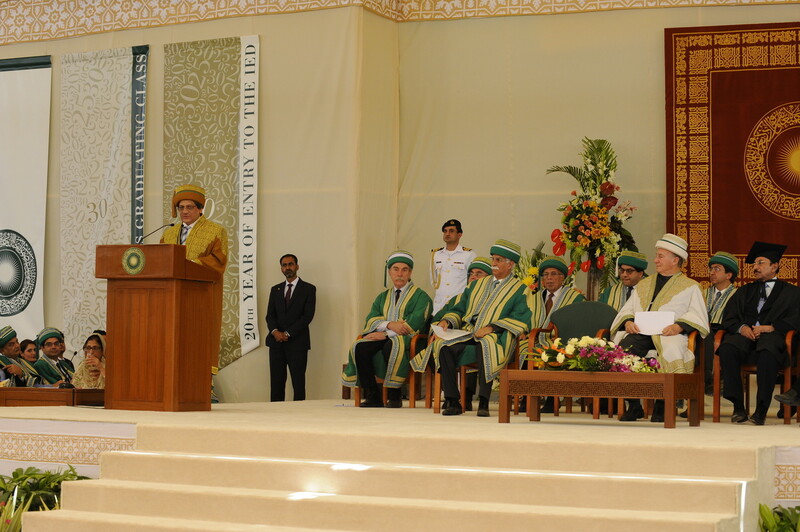 His Excellency Dr Ishrat Ul Ebad Khan, Governor of Sindh, the Chief Guest at the Convocation, delivers his address. Thank you for inviting me to address the Convocation ceremony today. It is indeed an honour and privilege to be a part of the 26th Convocation Ceremony of the Aga Khan University. To the graduates of the Class of 2013, let me first congratulate you, your families and your distinguished faculty. Your accomplishments should be a source of pride for you, your University and indeed the country. As you are all well aware, the year 2013 is also very special for the University as it marks many milestones. It has been 30 years since the granting of the University’s charter and the graduation of the first batch of nurses from the School of Nursing and 25 years since the graduation of the first batch of doctors from the Medical College. It is an opportune moment for me to pay a tribute to His Highness the Aga Khan for his inspiring leadership, his strategic vision and his profound commitment to humanity. His contributions – in our country and beyond – to education and development in improving the human condition, and above all to the ideals of excellence and the values of public service, social responsibility and human compassion. Under His Highness’ leadership, the work of the Aga Khan Development Network has established a model for empowering the underprivileged. Your Highness I urge you to continue investing and supporting this country. Young graduates, you should be proud that you have been students of an institution that has been a role model: your University has consistently invested time, money and resources for its development and for the people of Pakistan in education, health care and human resource development. As the Aga Khan University, the country’s private university, has shown, investment in education is the only way to progress. Over the years we have seen AKU empower its graduates with initiative, leadership skills; critical thinking and problem solving skills. Dear graduates, I urge you to take a look at the countries in the developed world: Japan, US, UK, Germany – all of them recovered from two World Wars – through their visionary leaders, like the ones your University has, and a youth that believed in its nation, like the ones I hope you turn out to be one day. To make this country a success we need to utilize the potential of the youth of this country. They say hope is eternal and faith infinite. Your University leadership and I have plenty of both. I wish you all the luck and hope many of you stay back to invest in this country! Thank you for inviting me today to address this historic occasion!